Apple picking season is underway, so consider making the crisp, juicy fruit part of your meals. 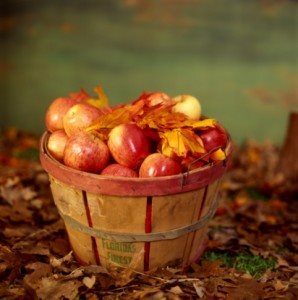 Not only are apples tasty, but they offer a plethora of health benefits. They are rich in fiber and vitamin C, and they’ll fill you up without ruining your diet. In a recent study, women who ate a cup of dried apples daily for a year lost weight and lowered their cholesterol. In fact, the fruit may protect you against heart disease. An antioxidant found in apples may play a role in reducing your risk of dying from a stroke or heart attack. walnuts. The recipe is super simple and quick to make—the prep takes only 15 minutes (then 30 minutes to bake). Find the recipe here. Can’t get your kids to eat their Brussels sprouts? A serving of this tasty dish might do the trick. It’s a blend of lemon juice, Brussels sprouts, onion, garlic, diced Red Delicious apples, sugar, water chestnuts, golden raisins, lemon rind, nutmeg and apple juice. Get the recipe here. You might not expect to find Fuji apples, Dijon mustard, goat cheese, arugula and toasted pecans on pizza, but this combination of savory and sweet really works. It’s both healthy and simple to make. You’ll find the recipe here. This might just be the perfect fall sandwich. It’s a blend of rich apple butter, mild smoked gouda and sea salt on sour dough bread. Get the recipe here.